Two surefire Hall of Famers played in the Bronx last night. One is having the worst season of his career at 37 years old, hitting nearly 60 points off his lifetime average, and still getting paid $17 million. The other one is Derek Jeter. Which is to say, we have no idea how to deal with the end of Ichiro. The clock always wins in baseball. It outruns even Ichiro going first-to-home, even as a part of us honestly believed he could do this forever. Why not? His MLB numbers always fit neatly into Bill James' gray ink, rarely varying much (his on-base percentage never dipped below .350, and only once exceeded .400). His unique swing and first step out of the box were immediately and spectacularly effective in America, and they stayed effective for ten years, spraying out a record string of 200-hit seasons. As long as we've known him, he's swung that Ichiro swing, and it's never not worked. Now, by any criterion — and especially by the standard he's established — Ichiro is having a disastrous season. He's hitting 35 points off his career low. He's holding a negative WAR. It took much longer than it did for Jeter, but he's being pronounced dead with all the accompanying pomp: a notable attempt from the Times to devalue his career performance. We're all flailing wildly because we're realizing Ichiro's clock is down to 200 games (his contract is up after next season, and it's widely assumed he'll hang it up or go back to play in Japan), and we're failing miserably at putting him into context. There's the obvious temptation to try to lump him in with another Japanese star on the downslope of his playing days. Ichiro and Hideki Matsui will be remembered by history for midwifing the Japanese position player as a lineup staple. But they've had two very different career arcs, even if they're meeting at the end. Matsui went from the most popular team in Japan to the Yankees. Ichiro went from a small market team to the Mariners. Matsui smiles all the time and has a stealthily excellent rapport with the media. Ichiro embodies most of our (not unfounded) stereotypes of Japanese baseball imports: He's taciturn, he's not a clubhouse presence, his personal life is off-limits. Seattle was probably the best place for his American career, basking on the West Coast in the peripheral glare of Japanese mythmaking. That's who he is in the grand scheme of the Baseball Almanac: a Hall of Famer who toiled on a team that mostly — with one major, unreal-seeming exception — wasn't very good. He stayed out of the spotlight, to his preference and benefit, and just did work. And what he did up in his corner of the map was a basic skill that translates to any league. Unlike Matsui's sketchy 500 career home runs, Ichiro's hit total would almost certainly have reached 3,000 if he'd played his entire career in the majors instead of coming over at 27. He got to a combined 3,000 a few years ago, and is 643 hits away from 3,000 in MLB. Hitting may be the most primal talent in baseball — Ichiro's stroke would have been unstoppable in the deadball era — and he's been preternaturally good at it. And he can still hit. He's not having the worst season. He has the highest qualified batting average of anyone on his team. He's 10th in the league in hits. That's what he does; he grinds. He could probably play at this level for five more years if he wanted to. If he had played his entire career here, we'd be wondering if Pete Rose's mark was reachable. You do something like that the way Rose did: through consistency, not dramatics. And Ichiro's probably the most consistent hitter in baseball over the last decade — never hitting worse than .303, never playing fewer than 146 games. His Japanese stats tell the same story, but those aren't part of our baseball universe. We only know the skinny guy with a cannon arm who blinked into existence in 2001 as a grown man. He's like a Creationist Earth, sprung fully-formed from the void. He was born with that distinct swing, falling off toward first as if he believes in his heart of hearts that being a leadoff hitter means getting on base before even putting bat on ball. It's one of the most identifiable, least mechanically sound swings in the game, a thing of wonder rather than a thing of beauty. 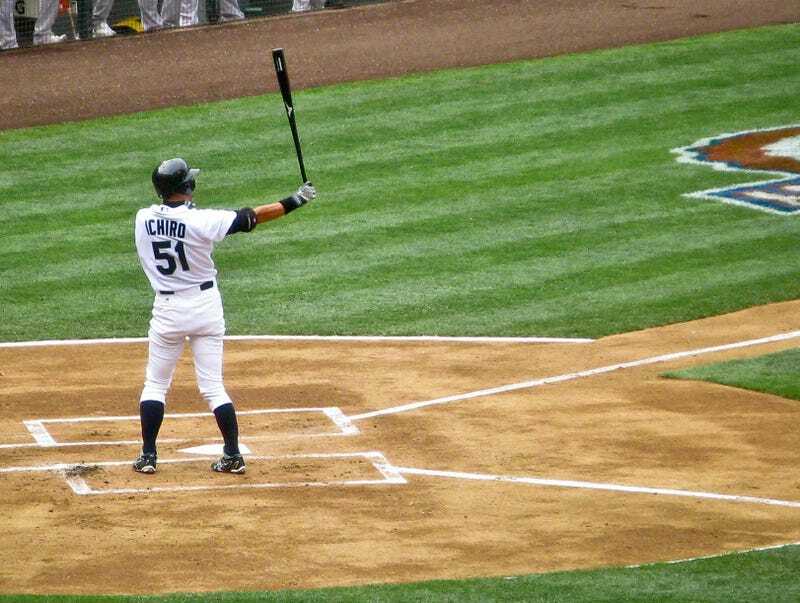 If we insist on sorting Ichiro, he belongs with guys like Mariano Rivera (cutter) and Kareem Abdul-Jabbar (sky hook) as sportsmen who could do one thing really well, and who never needed to change. Ichiro was never going to be overpowered or fooled at the plate, but that's not how the clock gets you.